I have hated fresh tomatoes with a passion for my entire life. They loiter on the side of your plate in pubs, oozing their juice over the best chips or lurk surreptitiously in the middle of shop-bought sandwiches, making the bread soggy. This makes me grumpy. If I'm dining in company, whoever my companion is (historically my grandfather or mother, now the husband) will immediately be furnished with said tomatoes in exchange for cucumber and/or coleslaw. They offend me so much I can't even have them on my plate. It's the slimy insides I don't like. And cherry tomatoes are the work of the devil as they have the greatest slime-to-flesh ratio of all tomatoes. I've got nothing against cooked tomatoes. Not cooked whole tomatoes, you understand. But if they're in a sauce then I'm okay with that. And, one of my favourite recipes from this blog so far has been Thomasina Miers' chilli jam - which contains mountains of tomatoes. I keep a huge jar in the fridge to dollop into sandwiches or eat alongside salads. The only time in my thirty-something years on this planet that I've ever enjoyed tomatoes was the first time I met the parents of my very first boyfriend. Despite him being off to the top end of the weird scale, I really liked his parents and when they offered to make us dinner, I politely accepted. His dad was a keen gardener and grew all his own fruit and veg. You can imagine my horror when the aforementioned meal turned out to be chicken with a fresh tomato salad. But because I was bought up to have good manners (things have changed since then!) I accepted the plate with good grace and steeled myself to do battle with the mound of tomatoes, taunting me. What a surprise. These were firm and tasty and had that gorgoeous fresh-grown tomato smell. I've always loved that smell and it reminds me of when my mum used to grow tomatoes when I was a child. Dressed in a simple vinaigrette and sprinkled liberally with salt, they were an absolute revelation. 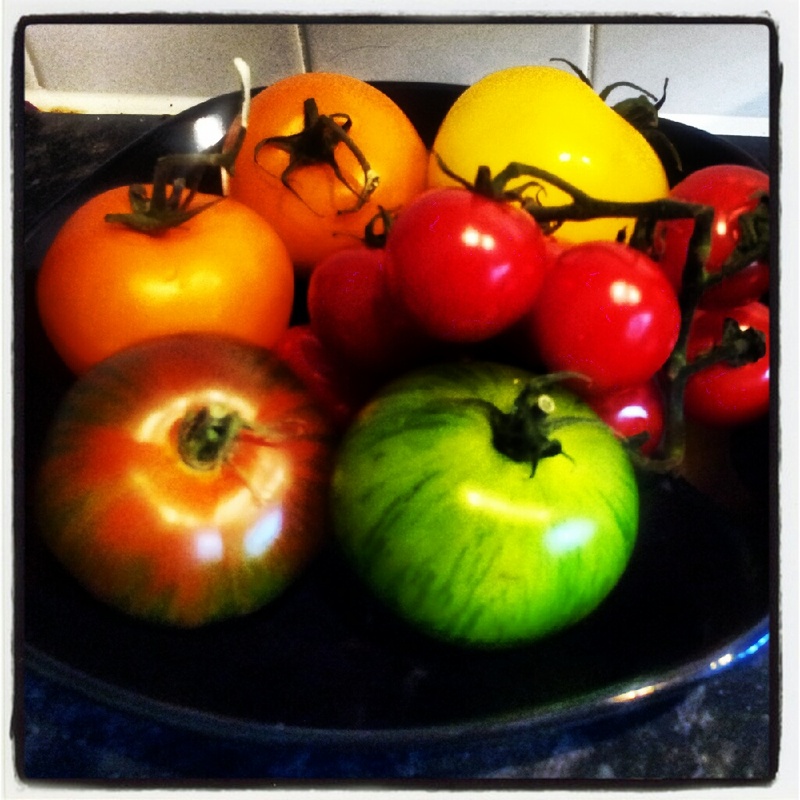 Nothing like those squidgy, slimy, dreary salad tomatoes peddled by the supermarkets. Sadly for my tomato-eating career, we split up soon afterwards on the advice of his mother. She had the sense to see I could do better for myself (I couldn't have done worse!). Don't get me wrong - she liked me. She even told me I was dating the wrong son and that I'd be a fantastic daughter-in-law (I was a late starter on the dating scene). But the weird, psychotic tendencies of son number two quickly sent me running for the hills. The past fifteen years have been plagued by further encounters with both people firmly at the wrong end of the weirdo scale and nasty tomatoes too. I'm sure I've eaten in places that could've changed my tomato fearing mind, but it's just something I would never consider ordering. When you go out, you go out to eat for pleasure, not to torture yourself. Lycopersicoaphobia has remained firmly rooted in my psyche. Until I got my copy of Wahaca: Mexican Food at Home by Thomasina Miers. If you're a regular reader, you'll know I adore Thomasina's books. And I'm now eager to holiday in Mexico one day (although I'll be going by myself as Mr Fussy wouldn't eat the food and would worry that he'd get kidnapped by a Mexican drug cartel). Flicking through the book, the one recipe that really captured my imagination was the aforementioned Three Tomato Salad. Yes. Seriously. I've been obsessing about this for a couple of weeks now to the point where I'm wondering exactly why I'm craving something I can't stand. For the record, I would like to categorically state that I am not pregnant. My mother will obviously be very disappointed by that. My boss will most likely be relieved. As will the husband because he's starting to make noises about me working late too often. I am actually working to keep a roof over our heads! So today, I headed to Morrisons to pick up some real tomatoes. They've recently revamped the fruit and veg section and you can buy all manner of weird and wonderful things. And lots of it doesn't come stuffed into a huge plastic box so you can just buy what you need. Okay, it's probably more expensive, but I don't mind paying a bit more to buy only what I need if it's far tastier than a giant economy pack of flavourless tomatoes. 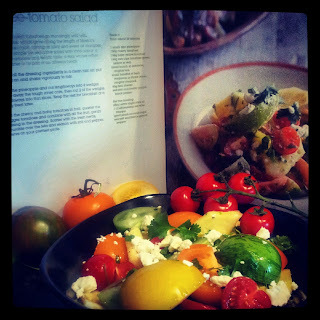 I was spoilt for choice with stripy Heirloom tomatoes and tiny orange plum tomatoes, regular cherry tomatoes on the vine and pretty orange and yellow tomatoes. I really wanted someone to share this joyous occasion with but the husband is crashed out on the bed after another session of the Insanity workout and I'm too impatient to save it until the next time I'm at my mothers so it seemed the perfect antidote to yet another wet and dreary day. The flavours are amazing. Fresh tomatoes with feta and pineapple, mixed with a red-wine vinegar dressing. The salt of the feta cuts beautifully through the sweet tomatoes and is balanced well with the acid from the pineapple and the dressing. In fact this now ranks up there with my all time favourite recipes from this year. And I have enough tomatoes left to make it again for tomorrow's lunch. I was planning on using them to make Gazpacho, but it seems a criminal waste of beautiful tomatoes.